Dialga GX is another card based on the Ultra Prism counterpart that has the same 180 HP, attack costs/names/effect, and retreat cost of three, except that it is a Metal Type that is weak to Fire and resists Psychic. Since the attack cost is the same, you can run both versions so that you can diversify Weakness. Dragon is weak to Fairy while Metal is weak to Fire. I don’t have much to say here, except that the dragon version of Dialga-GX was the 10th best card of SM Ultra Prism due to having a GX attack that SKIPS your opponent’s turn! Dialga GX (FLI 82) received a slight adaptation in the Forbidden Light expansion set. All of its attacks and stats are exactly identical, the only difference is that it is a Metal type instead of a Dragon type. And much like Empoleon yesterday, that new Metal typing makes zero difference in the quality of the card. Overclock is still a good starting attack and might be in consideration as a four of starter card (much like Drampa GX) in Metal decks; however, like we saw with Furfrou last week, you’re probably only going to pull three additional cards from Overclock. Plus, making Dialga a four of in deck strikes me as being awful, it’s definitely a one of tech in at most. 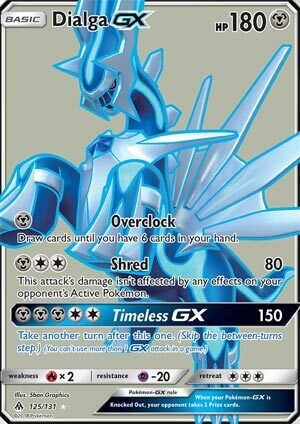 Shred is still a decent, albeit underpowered, attack, and I pulled off a Timeless GX in one of the matches I played with this yesterday, and Timeless is still an amazing attack. However, Dragon or Metal typing, Dialga is still not that good, but I am starting to think that I prefer Timeless over Sun’s Eclipse. Like many DM Necrozma GX players, we dumped Dialga early on back in February in favor of the Sun’s Eclipse strategy. Start something up top (Mew FAC in my case usually), fall behind by a prize card to activate Sun’s Eclipse, and then you can still use Meteor Tempest on the next turn. We’ve all seen this, probably either fallen victim to it or used it ourselves a number of times. I only played a couple of games with Dialga in my DM Necrozma GX build, but the one game I was able to pull it off, I really liked it, and I may well substitute in a Dialga and try to go for Timeless more often. I said yesterday that I’d prefer playing DM Necrozma GX or Solgaleo GX over Empoleon, and I’ll definitely stick by that. I have been trying some different cards with DM Necrozma, cards like Lady or Dashing Pouch (not a good idea) and Frying Pan. I still really feel that there is a really good list out there for DM Necrozma GX, I just haven’t quite found it yet. I am definitely leaning back towards the Magnezone builds, however, since we’re seeing so little Garbotoxin Garbodor. I might also try to tech in a Dialga into my Solgaleo GX deck, Timeless might nicely pair with Solgaleo GX’s Ultra Road ability. Go figure, it’s another Pokemon from Ultra Prism – but this time, it’s Dialga-GX! Dialga-GX is the same as its Ultra Prism counterpart, but with the change to Metal giving it a Fire Weakness and Psychic Resistance. Here is the link to our last review on it! Pretty self-explanatory really. In fact, this one’s even easier than Empoleon! The thing is, the only major differences are the Type and Weakness/Resistance. Dialga-GX goes from a Dragon-Type with a Fairy Weakness to having an advantage over Fairies and even being resistant to Psychic! And that’s pretty significant – he does get better support overall as a Metal-Type rather than a Dragon. Don’t get me wrong, Dragon has some pretty good support, but Metal just has more support and better support. So being Metal is much more advantageous at the moment. Arora Notealus: Dialga-GX could have had the potential to push into the Top 10 for sure, but compared to a lot of the other cards in the set and combined with the fact that he’s technically a reprint of sorts, it hindered him a bit. It’s not that the Type change is irrelevant, far from it; it’s more likely that, like many of the reprints with Type changes, he got overlooked or simply cast aside. Even I overlooked him in favor of some of the other cards in the set, but that’s not to sell him short! If anything, this is just the version of Dialga-GX that we should have gotten the first time around. Side Review: Greninja-GX – another newer archetype that’s been introduced, Greninja-GX has a lot of potential in the damage department, but might be falling short simply because of the inherent deckbuilding problems. One of the most noteworthy is, funny enough, the inclusions of Rare Candy – because while you could use Rare Candy to evolve a Froakie right into Greninja-GX, the fact that its attack can bounce it back to the deck for reuse puts Rare Candy in an odd spot, since it doesn’t have that level of recyclability. Next Time: A special means of transferring special things!